The number of improving housing markets across the country rose to 99 in September, up from 80 metros that were listed as improving in August. The index now includes representatives from 33 states as well as the District of Columbia. The index identifies metropolitan areas that have shown improvement from their respective troughs in housing permits, employment and house prices for at least six consecutive months. Markets added to the list in September include such geographically diverse locations as Tucson, Ariz.; Jacksonville, Fla.; Springfield, Ill.; Greenville, N.C.; and Bend, Ore.
More metros across the country are experiencing a sustained uptick in house prices, employment and new building activity as rising consumer confidence in local market conditions pushes more people to consider a new-home purchase. That said, overly tight lending conditions for builders and buyers continue to slow this process considerably. The number of metropolitan markets on the NAHB/First American Improving Markets Index (IMI) rose to 101 in April from 99 in March. Markets on the list must have improved in the three critical indicators of employment, housing permits and home prices for six months or more. In April, 88 markets remained from the March list, 13 more were added and 11 markets dropped off. Except for Syracuse NY, ten markets fell off the list because their relatively small house price gains that got them on the list fell below their respective prior troughs. The average house price increase for the ten dropped markets was 0.4% compared to 3.2% for all others. Syracuse’s housing permits fell below their previous low. 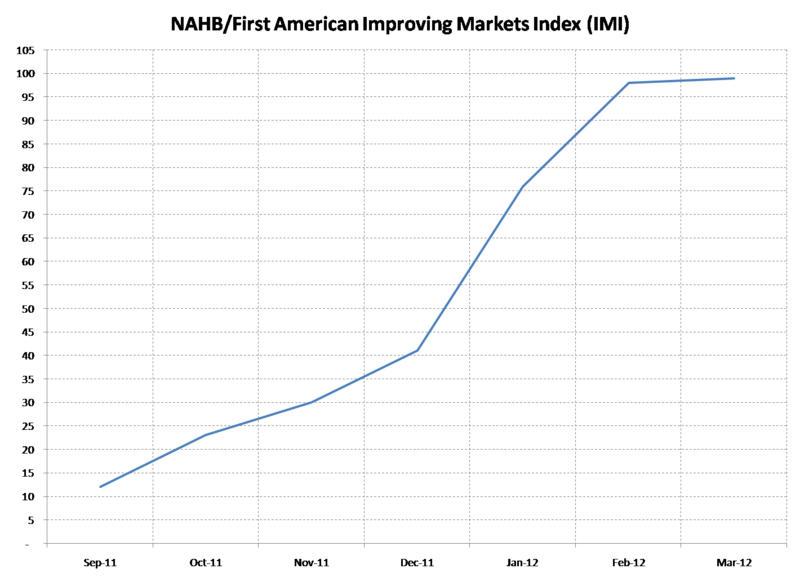 The index has continued to grow since inception in September 2011 although the past two months have shown very small growth, up one point from February to March and two points in April. Economic and housing recovery will continue to improve but the path may not be steady as job growth slowly spreads to a wider variety of economic sectors. At 101, the total number of markets on the IMI is more than one-quarter of all metropolitan areas. As seen on the map below, the markets represented are spread across the US and include metro areas that suffered severe downturns, e.g., Detroit, and those that had much less pain, e.g. 11 Texas metros. The primary point of the index is demonstration that markets are local and there is a wide difference in recovery speed and timing across the US. 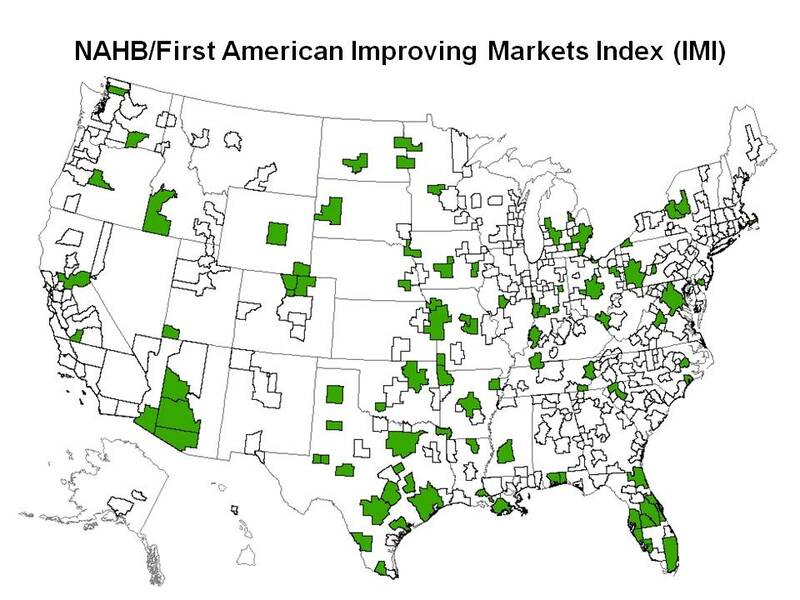 The March NAHB/First American Improving Markets Index stands at 99 markets or over one-quarter of all metropolitan areas. The index measures improvement in three aspects: employment, single-family building permits and home prices. To make the list, a metropolitan area must see improvement in all three indicators for six or more months. At 99, the March index added 31 metropolitan areas to the 68 that remained from the February list but lost 30 metro areas primarily because of weaker house prices. In those 30 areas, home prices had moved forward by 2.6% since their trough while the areas that remained on the list had an average 4.7% increase since their respective troughs. Small declines placed the 30 area back below their previous trough. Four metro areas (Anchorage AK, Washington DC, Jackson MS and Iowa City IA) that fell off the list in the past made it back on in less than six months because the employment data was revised by the Bureau of Labor Statistics and the previous drop was eliminated. Two-thirds of the states have at least one metro on the list and they are geographically spread across the country. A complete list and the change in each indicator can be found at www.nahb.org/imi. Texas leads the states with 12 metro areas, followed by 9 in Florida and 8 in Michigan. The index highlights markets that are improving, some because the underlying damage was not as severe and some because their bottom has been so far from normal that home buyers and investors are finding bargains are available. 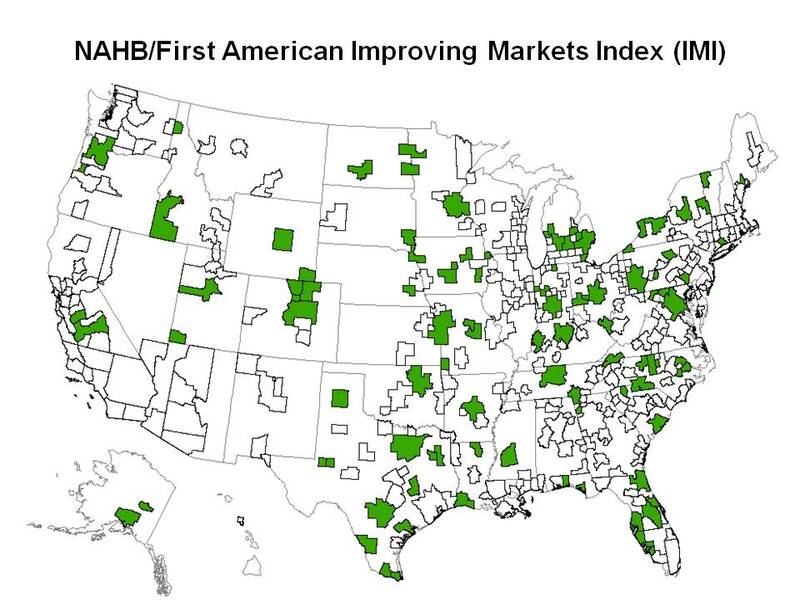 NAHB recently unveiled an index that tracks housing markets on the mend, the NAHB/First American Improving Markets Index (IMI). The IMI is intended to draw attention to the fact that housing markets are local and that there are metropolitan areas where economic recovery is underway. The index measures three readily available monthly data series that are independently collected and are indicative of improving economic health. The three are: employment, house prices and single family housing permit growth. For the fourth release , 41 markets are currently classified as improving under a conservative examination of local economic and housing market conditions. Among these areas is the Bismarck, North Dakota metropolitan statistical area (MSA). The health of the Bismarck housing market is in part due to its position as a large and rapidly growing regional healthcare center, its excellent infrastructure and its role as the state capital. These factors have made Bismarck a popular destination for retirees from other parts of North Dakota as well as for many other individuals. Of late, however, local growth is primarily due to the recent discovery of the Bakken shale and the even larger and more recently discovered Three Forks-Sanish formation. While they are both about 100 miles away, their effects are being felt in many ways. According to home builder Chad Moldenhauer, the President of K & L Homes, “oil and gas service companies are setting up shop here as are pipeline and oil drilling firms, and the oil refineries are booming.” He went on to say that “oil industry executives and senior managers are now moving their families here and with growth at both Medcenter One and St. Alexius, there is an increase in the number of high income households who not only want nice housing but often want new houses.” As a result, education levels are rising in the area. Comparing educational and industry data from the 2000 Census to the 2009 American Community Survey confirms these impacts. Today there are 3,012 (or 17%) more management jobs than in 2000 and 816 (or 25%) more professional jobs. Reinforcing these findings, the number of people with a high school diploma increased from 15,837 to 18,239 and individuals with some college rose from 14,129 to 14,806. The number of people with an associate degree jumped from 6,886 to 8,958, those with a B.A. jumped from 11,814 to 15,344 and the number of those with a professional degree increased from 3,808 to 4,705. Emblematic of the changing workforce dynamics, employment in the finance, insurance and real estate industry grew by 31% followed closely by employment in professional services which increased by 25%. According to Eddy Mitzel, President of Mitzel Homes and the North Dakota Association of Builders, “our very low unemployment rate, the construction of several coal fired gasification plants, the new wind farm, increasing immigration from western North Dakota, the new cancer care center and the oil boom have allowed us to totally skirt the recession.“ As a result, house prices have performed well over the past few years. Prices are up 7.9% since the trough in February 2010 and have now surpassed the previous high set in July 2011. Improving economic conditions has resulted in payroll employment higher than ever with 64,800 employed persons, breaking the previous high of 64,500 set in October 2011 and up by 7.1% since the trough in December 2007. Single family permitting activity is up a robust 10.7% on a seasonally adjusted monthly average basis from the trough set in March 2009. While new homes are being built in many parts of the Bismarck MSA, activity has been primarily centered in the northwest part of the City of Bismarck and the southwest part of the City of Mandan.